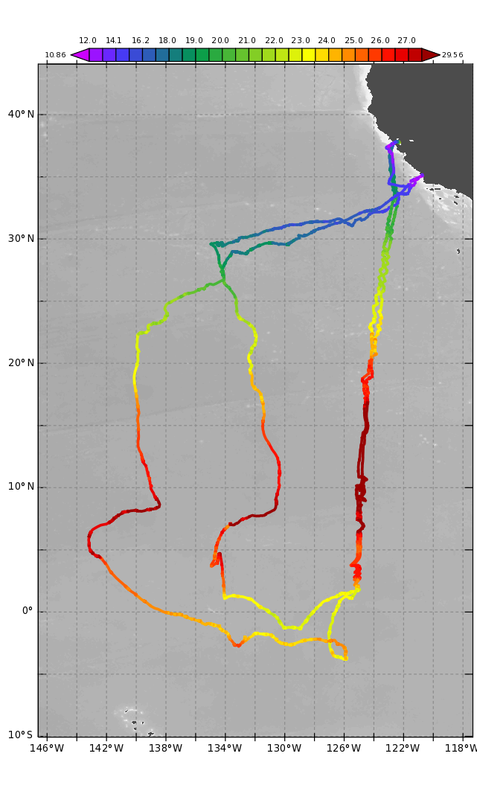 Tracks created by the Saildrones during the mission, colored by Seawater Temperature, as recorded by the drones. Click for a larger image. After sailing farther and longer than planned, both Saildrones are now safe at home. SD-1005 was recovered on May 6, 2018 in San Luis Obispo Bay, CA, while SD-1006 sailed all the way back to San Francisco Bay, before being recovered on May 18, 2018. Overall, the project scientists consider this to have been a very successful mission. Though still sorting out a few measurement glitches, the researchers are generally very pleased with the data so far. They will spend the next several months taking a good look at the data, and learning more about the platform and measurements, but initial findings show that the oceanographic and atmospheric measurements made by the Saildrones are high quality. This platform may be a good tool for providing key observations for long-term weather forecasts. The next Saildrone mission to the tropics is slated to begin by September 2018. Once again, two drones will sail to the equator and back, making surveys of fronts and features along the way. Stay tuned for a brand-new blog! 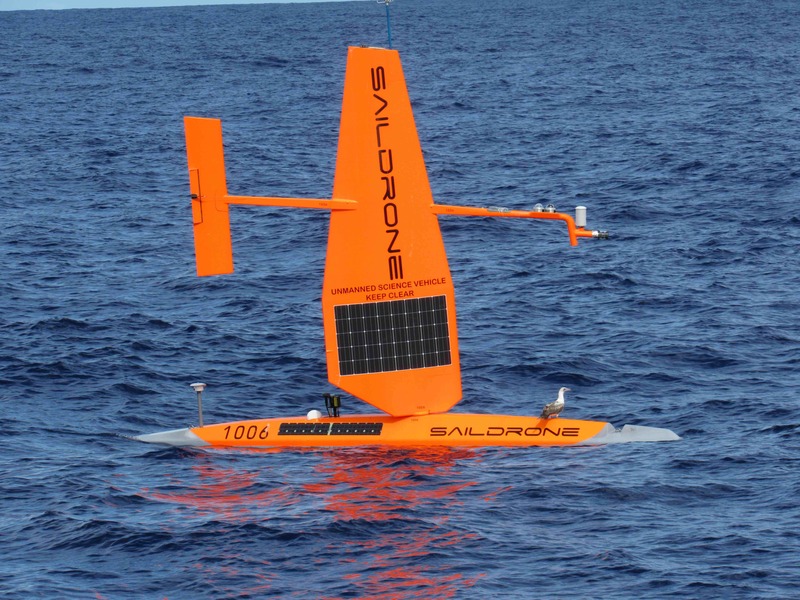 Read about Saildrones and this mission in Science magazine. Interest continues to grow in the Saildrone platform, and its potential for future science missions. The story of the vehicles, and our mission to the tropics is shared in the March 9 issue of Science magazine. The Saildrones are currently making their way through the tropics on their way home. It's sunny and warm, and the water is lovely. Just like you'd want for a tropical vacation. In fact, the water is so clear that the cameras on one of the drones snapped a picture of a few nearby fish. Based on the size of the drone, the fish are a couple feet long. Any guesses about what species these fellow travelers might be? One of the Saildrone vehicles during a close approach to the R/V Revelle during a comparison study at the SPURS-II site. Over four months into their six month mission, the Saildrones are turning back towards home. Much has been learned already during this visit to the tropics that will help to make future missions even more successful. So far, the drones have carried out side-by-side measurements with ships and moorings. They sailed around buoys to measure changes in the ocean and atmosphere with time and space. They traveled through regions of rapid changes in the surface water, locating fronts. 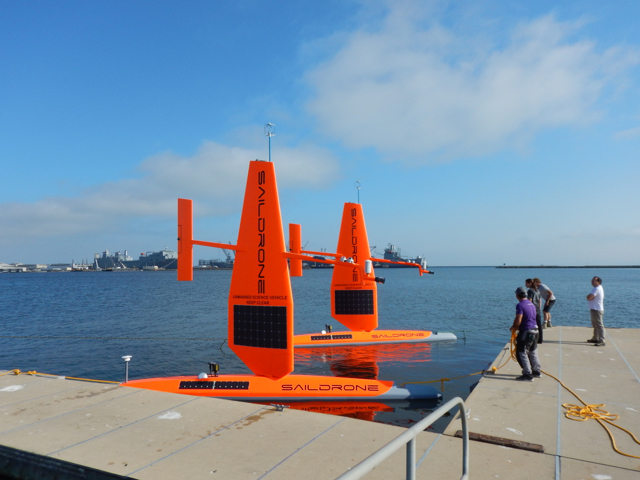 The vehicles also carried new instrumentation under development, and acquired valuable test data that will help make these new instruments a standard part of the Saildrone instrument suite. The Saildrones will continue gathering data during their transit back to California. There are more fronts to study, and more buoys to visit. Not everything was successful. 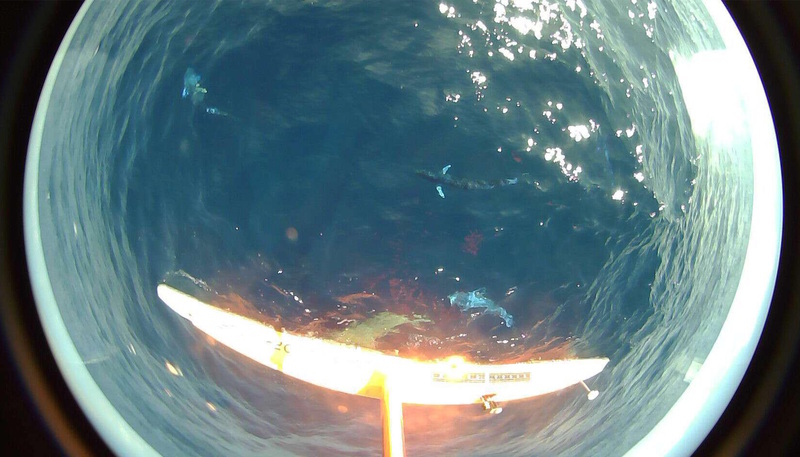 The drones turned out to be very difficult to navigate near the equator, in strong currents and light winds. The conditions in the area during this La Nina year were particularly tough. But that information was valuable, too. The team at Saildrone, Inc. are already working on how to improve the vehicles so they will function better in these types of conditions. Planning for the next Saildrone field deployment is already underway, and it will build on the successes (and failures) of this mission. Strong currents, shown by white lines over background colored by current strength, have pushed the Saildrones off their planned course. Adapting to conditions, SD-1 will swing back around to visit the TAO mooring at the equator, while SD-2 will move west and north to look for fronts. Since leaving the SPURS-2 study site, the Saildrones have been traveling south along the 125°W longitude. They have been spending a day at each of the TAO mooring sites along the way, in order to validate data and also to study any variations of the ocean or atmosphere in space and time around each site. 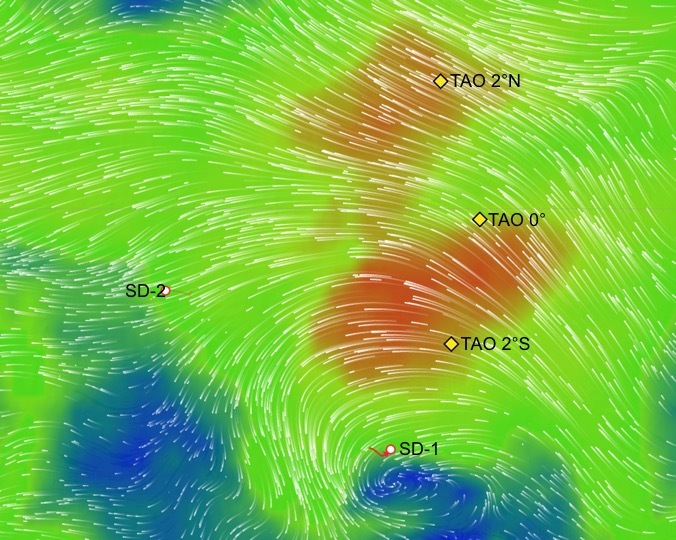 However, since leaving the TAO site at 2°N, the drones have been fighting strong westward currents. With light winds, blowing in a similar direction to the currents, the drones have been pushed off course. Since this was always intended to be a learning mission, plans are being adapted to accommodate the conditions. One boat (SD-1 above) will continue south, and then work with the currents to circle back north and east to try to get to the TAO mooring site at the equator. The other drone (SD-2), has been re-tasked. It will also begin traveling with the currents, moving west and north to map out fronts in the region. Field research always has its challenges, and this possibility was not unexpected. While we're learning about the science in the region, we're also learning the capabilities of the vehicles, and what could be done differently for future missions. 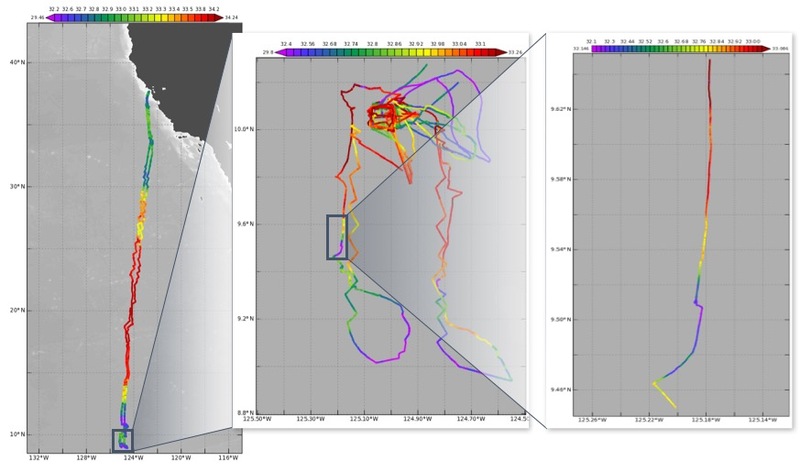 Saildrone tracks colored by salinity during the transit from California (left), and at the SPURS-2 study area (middle). The drones navigated boxes around the mooring at 10.05°N, 125.03°W, before transiting North and South along either side of 125°W, to search for fronts. The purple patch (right) indicates fresher water. Note the different salinity scales. Click to enlarge. The SPURS-2 region is in the North Pacific Intertropical Convergence Zone (ITCZ), where frequent rain events can create areas of very low salinity. There are large scale salinity fronts in the region, with increasing sea surface salinity (SSS) both to the north and south. When winds are weak, rainfall leads to short-lived fresh anomalies at the surface. By participating in the SPURS-2 study, the Saildrones have provided important records of the meteorology and surface response during these convective events in the ITCZ. For example, the data records as the drones passed through the fresh water patch shown in the image above. After nearly a month at the SPURS-2 study site, the Saildrones are now making their way south to the equator. 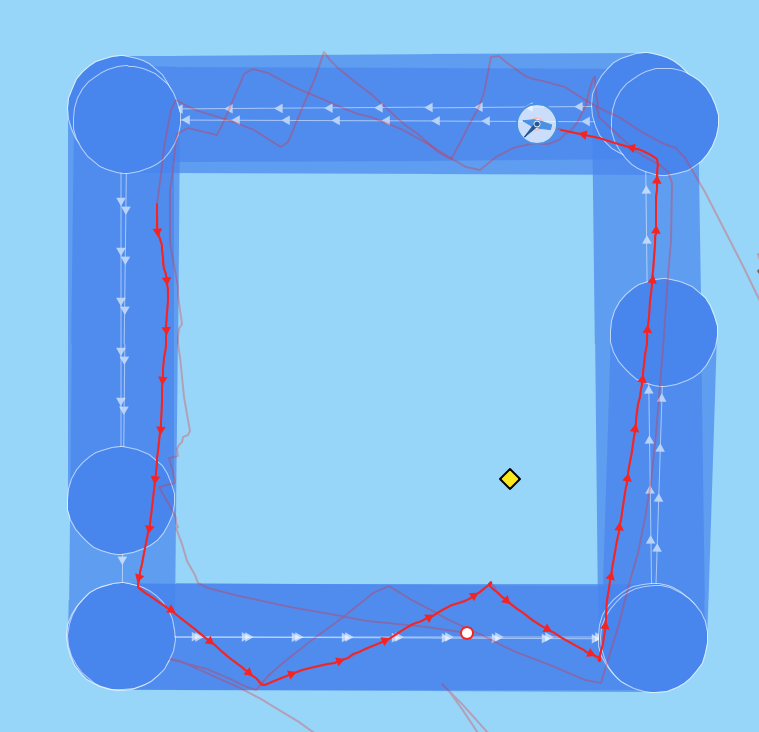 Saildrone tracks (red lines) show how the vehicles are navigating a box around the mooring (yellow diamond). While the ship is now busy doing surveys, the Saildrones are navigating a 10km box around a nearby mooring. This mooring carries meteorological instruments and about 60 ocean sensors, which complement the instrumentation on the drones. One of the things that the mooring and drones are all measuring is ocean currents, which scientists are very interested to learn more about. The Saildrones will both travel counter-clockwise, staying on opposite sides of the box. This will keep them far enough apart to learn more about the vertical structure of the ocean currents over a distance. Scientists hope to be able to see the vertical gradients, or changes in the currents, over the distance between the drones. The goal is to record near inertial oscillations, which are important in controlling vertical mixing of the surface ocean water. This can affect how the ocean interacts with the atmosphere, which relates to weather and storms. It takes less than a day for the Saildrones to travel all the way around the box. They will stay near the mooring until it is recovered near the end of next week. So, they're going in circles on purpose. The two Saildrones arrived at the SPURS-II field study region in the tropical Pacific on October 18, 2017. They were met there by the R/V Roger Revelle on October 22nd. Personnel on the ship were able to communicate with the Saildrone pilot to coordinate a mission. The ship and drones came close together to collect data nearby to each other. This will not only help to validate all of the measurements, but also determine some of the spatial resolution of the parameters being measured. For example, it will be possible to see how something like sea surface salinity changes between the location of the ship, and the locations of the two drones. These types of comparisons are also used for development of new capabilities. As a newer technology, the Saildrone is still being built up. Some things that can be easily measured from a ship with proven technologies, are just being created on the Saildrone. The Saildrone engineers are using this as a learning opportunity, to see how their measurements can be improved, or proving that the instrumentation is working as planned. Planned path of the Saildrones heading to the tropics. The Saildrones have passed the California / Mexico border, and are now in international water. They’re on a path headed southwest, as they make their way to the tropics. The drones are still more than 1,200 nautical miles from their next planned stopping point, in the middle of the Pacific Ocean. It’s expected to take about 30 days for them to get there, traveling at an average speed of 2kts. The first stop at the CCE mooring didn’t quite go as planned. Low winds made it tricky to get the drones close to the buoy. And unfortunately, the transmitter battery on the buoy died! We won’t be able to do a comparison with all of the data until the mooring is recovered in a couple months. 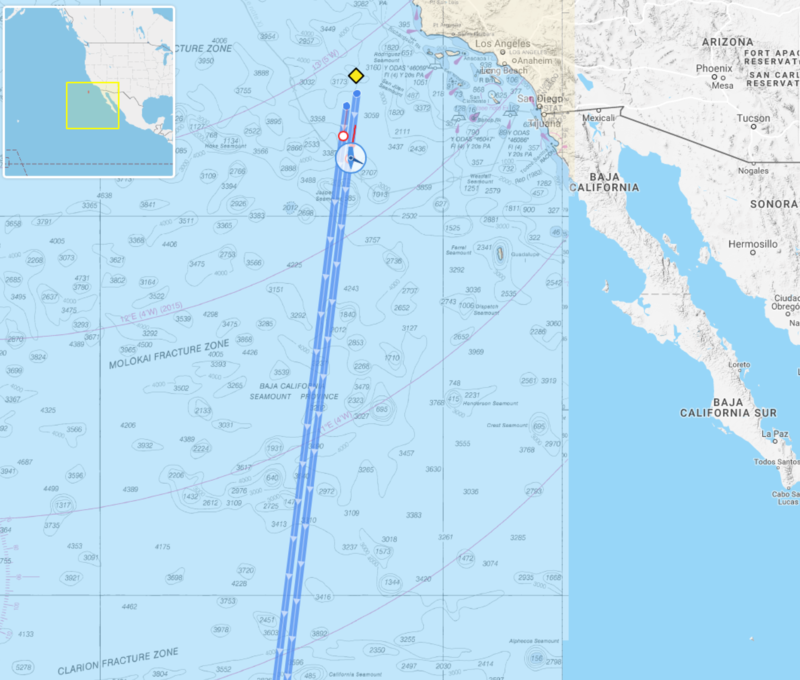 The first stop for the drones will be the NOAA-funded California Current Ecosystem Mooring (CCE-1), located off the coast of Santa Barbara, CA. Here, researchers will compare data from the mooring to measurements made by the instruments on the drones. This will allow them to perform a final check of the data being acquired by the drones before heading out on the science mission. The drones will also be able to sail around the buoy, giving some sense of how the parameters being measured may vary across the study area. Measuring this spatial variability can add value to the data set, and is part of what makes the Saildrone such a unique tool. While a mooring only measures data in one place, it can be very useful to know how the measurements may change over a larger area. This allows researchers to develop a bigger picture of the environment, and better understand influences and interactions within the climate system. After spending about a day at the CCE mooring, the drones will begin the long transit to the next study site. Getting to the site at 10°N, 125°W is expected to take about 30 days of sailing time. Scientists will be able to monitor the data during the transit, and observe any fronts or other interesting features along the route.